An enjoyable superhero movie that works in the action and plot departments, but not quite as much when it comes to romance and humor. Thor is a good, smart superhero movie. It’s smart enough to know that the way to keep things interesting is to constantly spend time in two different worlds, one real and one fantastical. If the movie had only gone to Asgard, the magic god world of Thor, for the beginning and the ending, it would have been a much lesser film. But it doesn’t. It travels back and forth between Asgard and earth for the entire length of the picture, and that goes a long way toward maintaining our interest. 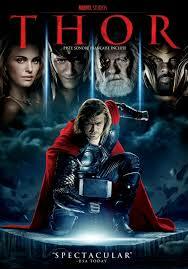 Asgard and the happenings that take place there are the highlights of this movie. After a brief opening with a team of scientists who run over a person out in the dessert, we find ourselves on Asgard for the real first portion of the film. later on, when thor is banished to earth, we go back to those scientists (Natalie Portman, Stellan Skarsgaard, and Kat Dennings), as they run him over, and we rejoin the story that we just got a glimpse of at the start of the film. On Asgard, the movie begins with the ceremony to make Thor the new king. his father, Odin (Anthony Hopkins) is the one running the ceremony in the golden palace of great extravagance. Hopkins is the go to actor these days for playing a powerful fatherly figure. Not long before this movie, he had the same sort of role in the wolfman, another big budget, action-oriented, popcorn picture. There is an attack on Asgard by creatures known as the frost giants, and thor follows it up by going to the land of frost giants and attacking them right back. To get from place to place, he has to travel on the rainbow bridge and then get transported off by the gate keeper, Hemdel, played by The Wire’s Idris Elba, who is terrific in this role, dressed in golden armor and a cool head piece. There’s good action at the start of this film with Thor and his team of friends fighting it out against these frost giants. They are monstrous creatures and it is all staged pretty magnificently. As a result of his attack, Thor has threatened the peace between the frost giants and the people of Asgard (which doesn’t seem to really make sense since the frost giants came in and attacked first). But Odin’s point is that the frost giants who attacked were only a few and did not represent their people. Thor is now sent to earth where we spend the middle portion of the film. he meets jane (portman) and she takes him to where s.h.i.e.l.d. has set up camp and made a temporary building structure around his hammer, which cannot be lifted from the earth. I love that agent colson, of the iron man movies, is a major part of this film. and i love the references and connections to the marvel universe. Colson mentions tony stark, and when thor breaks into the camp, jeremy renner’s hawkeye shows up with a bow and arrow, ready to shoot him down. Meanwhile, back on asgard, Thor’s brother, loki, finds out the truth about himself and his connection to the frost giants. his father becomes ill and falls into a sort of coma and loki takes over. he goes to earth to visit thor in the s.h.i.e.l.d. 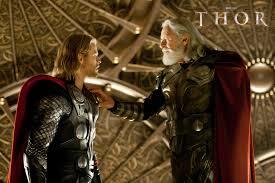 camp and tells him that their father has died and that their mother has forbidden thor to come back home. When thor’s friends come to earth to get him, loki knows something’s up, so he sends down a giant metallic robot to destroy them all. this proves to be the second big action set piece of the movie, and like the first one against the frost giants, it is also a lot of fun. thor of course returns to asgard to have it out with his brother for the climax. but before he leaves earth, He declares his love for jane and promises her that he will return. It feels forced. these two have not spent enough time together and have barely kissed. there’s one night where they talk about science vs magic and sleep under the stars, but the movie could have used a little more of that to make their relationship more convincing. The humor is also lacking in this movie. unlike iron man, which had ironic wisecracking humor that was often smart on multiple levels, this movie goes for cheap corny jokes. I suppose it’s hard to cover all the bases when making a superhero movie. Iron Man was something special and unique. Thor isn’t quite on that level, but What it does have going for it is a cool shakespearian plot (it was directed by kenneth brannagh, mr shakespeare on screen himself). That plot has it’s focus on a family divided, a power struggle over who will be the new king, and the way one brother betrays another. the action and set pieces of asgard are a lot of fun, and even the earth stuff involving S.H.I.E.L.D. seems to work. the romance and humor aren’t strong, but otherwise the movie is pretty good.